A call to Antoine Larricq at Fraser Yachts brings confirmation of a €500,000 cut in the price of his central listing, the 34.14m motor yacht Printemps. An all-aluminium superyacht built by Heesen in 1987 and refitted in 2009/2010, Printemps completed her 20 year ABS survey in 2009. Accommodation is for 10 guests in a main deck master suite plus two double and two twin cabins. Twin 1305hp Deutz engines give Printemps a cruising speed of 15 knots and a range of 3,600 nautical miles. 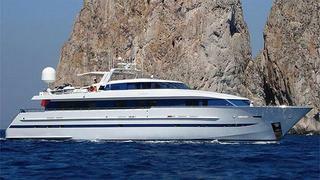 Antoine says she offers a very cosy and comfortable layout and makes a great party boat. The asking price is now down to €2.45 million.